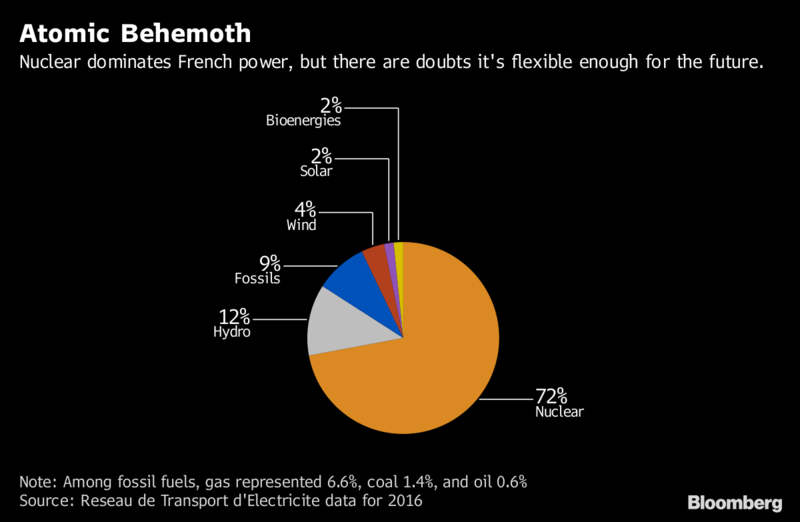 France’s nuclear giant has a plan to survive the wave of renewable energy that’s sweeping aside old-fashioned utilities across Europe. First it needs to disprove the conventional wisdom about how reactors work. Electricite de France SA says its fleet of nuclear reactors aren’t just able to provide a steady stream of power, they’re flexible enough to complement a large fluctuating supply of renewable energy. 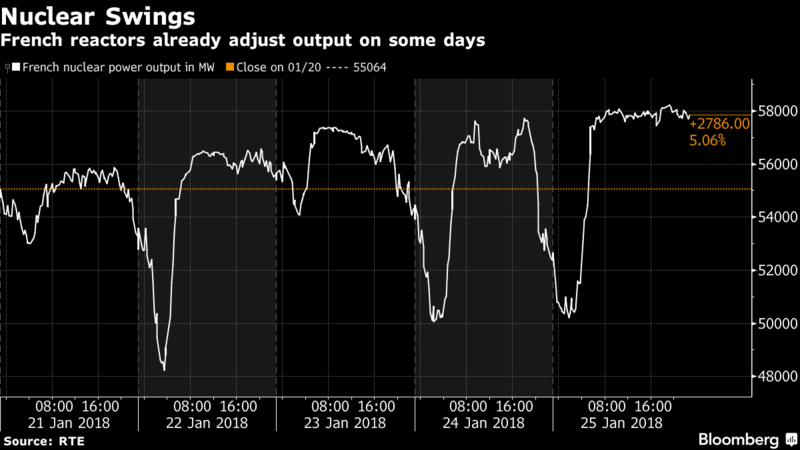 Combined with a 25 billion-euro ($31 billion) solar plan and potential investments in huge batteries, the utility says it can ride out the energy upheaval, while also helping the French government fulfill its goal of cutting reliance on nuclear power. That combination is the most cost effective way of generating low-carbon electricity in France, EDF says, but that doesn’t mean it comes cheap. Huge investments are needed to prolong the life of atomic plants plus billions more for renewables, but right now the utility is struggling to generate enough cash. It needs to spend 48 billion euros in the 12 years through 2025 to renovate reactors and expects to fund about half of the 30 gigawatts of solar developments the company plans on French soil by 2035. EDF, a 72-year-old state-run behemoth that operates the world’s largest fleet of reactors, isn’t perceived as being a natural fit for the future. The growing market share and falling price of fluctuating electricity sources like wind and solar is disrupting established power generators across Europe, forcing them to mothball or close plants that aren’t used enough to be profitable, or can’t quickly accommodate swings in supply and demand. Most atomic plants were designed to provide steady output around the clock, not submit to the whims of the weather. EDF disagrees, saying its reactors can vary output by as much as 80 percent twice a day. All 58 of them are equipped with control rods, which can be inserted into the core and slow the rate of fission that generates energy. The mechanism is usually used for emergency shutdowns by automatically falling in between nuclear fuel assemblies, but EDF the equipment can be easily maneuvered to accelerate or slow the rate of power generation. It says it can also fine-tune output by changing the concentration of a chemical in the reactor. The utility is already capable of offsetting a change in power flows as large as 21 gigawatts in less than 30 minutes — equivalent to more than 10,000 turbines falling still due to lack of wind — said Dominique Miniere, the company’s head of nuclear and thermal power generation. That matches France’s total wind and solar capacity today, although President Emmanuel Macron wants to at least double that by 2022. It’s unclear whether EDF’s proposals would increase maintenance costs or erode profitability, said Nicolas Goldberg, an energy expert at Paris-based Colombus Consulting. Abundant wind and solar energy in Germany has for several years forced power generators to adjust their nuclear output, hurting profitability. RWE AG, the largest electricity producer, expects profit from the unit that operates lignite-burning plants and reactors to fall significantly for 2017, following similar declines the previous two years. EDF says it can adapt with the increase in renewable energy until 2030 without much impact on the cost of its nuclear power production because of its 30 years of experience with flexible reactors, said Miniere. But before the company can prove its case that renewables and nuclear are the perfect couple, there are other challenges to overcome. European electricity prices are currently too low to cover the investments required to renovate EDF’s reactor fleet and build new facilities to replace the oldest plants. The utility will need some regulatory support from the government to foot the bill, said CEO Levy. In the U.K., the government guaranteed power prices for 35 years to encourage the company to build a new 19.6 billion-pound ($27.7 billion) nuclear plant. However, for Ecology Minister Nicolas Hulot, expanding renewable energy is the priority, not building new reactors.